While there is none of the tradition of tea in Thailand that exists in neighbouring Asian countries, more and more excellent Thai teas are finding their way to Western markets. A handful of European tea entrepreneurs have discovered the high quality leaf that growers in Thailand are producing. Entrepreneurs like the folks at Teamania. Many of the cultivars, and the growers themselves, are originally from China, although the oolong processes used are largely in the Taiwan style. Like this exquisite pouchong-oolong. Light fermentation (or, if you prefer, oxidation) followed by a gentle roast produces this absolutely delightful tea. 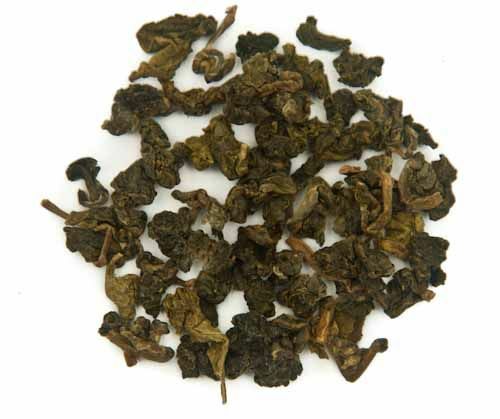 Aroma out of the package of this Oolong Four Seasons is richly flower-ful and slightly fruity (dried apricot? ), and further evoking that ethereal “iron” quality that presents itself in only a select few teas. Aroma and taste carry through to the cup. Leaves are bright, shiny, and tightly rolled, opening large and earthy when infused. As usual when sampling oolongs and pouchongs, I prepared the tea in my one-cup ducky-design clay pot. I generally cover the bottom of the pot with leaf; the leaves expand with each infusion until they fill the whole pot, which is the general idea of gongfu style tea preparation: lots of leaf and short successive steeps. After briefly rinsing the tea, I pour the rinse water into the fairness or sharing vessel (usually my two-cup Chatsford teapot) and then into my teacup to warm them before discarding the rinse water. Following each infusion I pour the made tea into the two-cup pot, diverting a couple of mouthfuls into my teacup. In this way I can appreciate the evolution of the tea throughout the tasting and still have a pot of tea for uninterrupted drinking. Two infusions at a time are blended together in this manner. I use fish-eye temperature water and increase the infusion time with each subsequent steep. How long do I let it steep? I couldn’t say exactly; just long enough. The wonderful aroma and taste have so far lasted through four infusions, and there seems to be enough life left in the leaves for at least another two infusions. Teamania is located in Switzerland and prices are listed in Swiss francs which are currently converting at about US$1.08 to one CHF. One thing I definitely like about Thai teas is that they are very well priced for the quality: this tea is currently listed at about US$21 for 200g or a little over seven ounces. What a miserable month it’s been! Just the right combination of rain and sun started everything to bloom. Which may be wonderful for many of you, but to those of us with spring fever it means constant stuffed-up noses and scratchy throats. Most days I could be drinking the best-quality tea in the world and wouldn’t know it, because smell is such an important part of taste. My dear husband kept telling me that everything I fixed was over-seasoned, but I couldn’t tell: Essentially everything I tasted — if I could even taste it — was like yuck. Now that heavy rains (almost enough to build an ark this year!) have washed away early-summer allergies, I can again enjoy smelling and tasting my food and drink. DH is no longer afraid to put a fork to the dinner on his plate. And I’m blissfully back to sampling a bunch of absolutely wonderful teas. 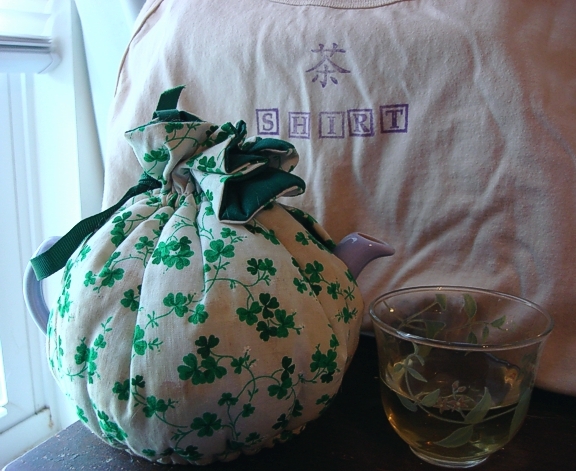 A potful and cup of Taiwan Tea Crafts Lishan Cui Fong oolong, posed in front of my hand-tea-crafted tea-dyed Tea Shirt. 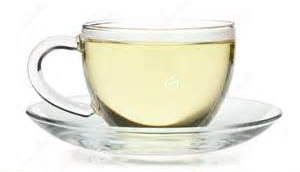 Lishan oolong is considered by many tea drinkers to be the crème de la crème of Taiwan oolongs. Grown high up — 5,000 to 8,000 feet — in the mountains of Taiwan, the combination of growing conditions in the Lishan tea area results in a smooth and lightly sweet cup that fairly bursts with all the flowers of a spring garden. Here’s where I have to admit that I had no idea that there was more than one type of Lishan oolong. Never having seen more than one Lishan listed at any other vendor, it seemed that all the tea from this region was grown the same and exhibited the same qualities. I have since learned that the Lishan growing region encompasses plantings at different altitudes — and yes, the altitude clearly does make a difference. Depending on where the plant grows it may get more or less exposure to the sun, and this affects the intensity of the taste and aroma put forth by the leaf. 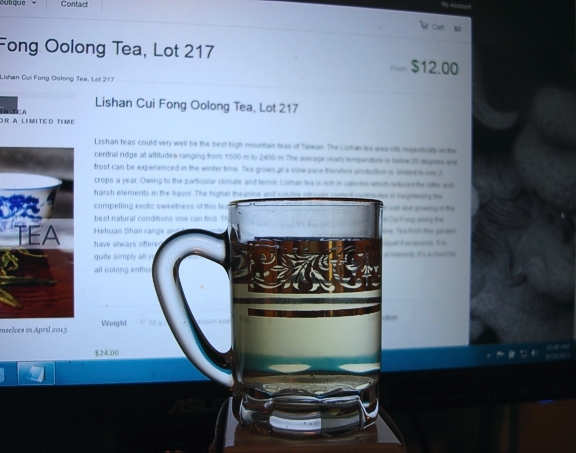 I sampled two of these green-style oolongs, or pouchongs, courtesy of Taiwan Tea Crafts: Lishan High Mountain Spirit Lot 230 and Lishan Cui Fong Lot 217. Both have beautiful aromatic tightly rolled leaves that open into a lovely bright green colour. The first of these imparts a lovely flowery taste and aroma: flowers with just a hint of spice and nuts, as if you were eating a flower. I’m on my sixth infusion of this tea and it’s fading a bit, but its qualities still come through as clearly as when I first opened the package. It’s like enjoying a spring garden without any of the allergy worries! I’m still on the second infusion of the Cui Fong, and it’s just as lovely as the Spirit. Grown at a slightly higher elevation where the plants enjoy more sunshine, the floral gardenia-type notes are more pronounced, with almost none of the flowery spice. I imagine that it will also last through at least six infusions. Tea drinkers may disagree on which particular tea they like best, but there can be no disagreement when it comes to freshness: the fresher the tea, the more intense the aroma and the more exuberant the taste. These teas were plucked and processed in May, and reached me just weeks later, and both exhibit a headiness that simply isn’t there in teas that are less fresh. 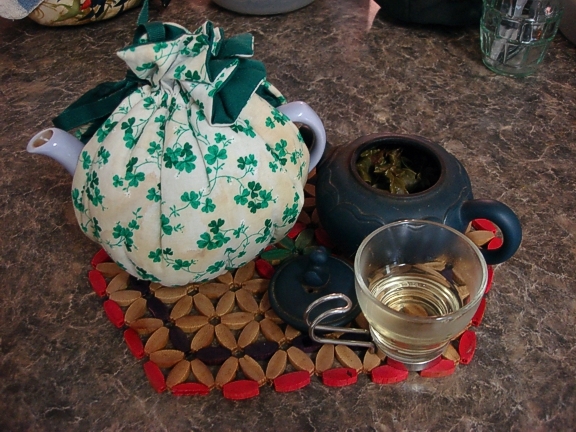 For those who are interested, I steeped these teas in my duck-design clay teapot in what I call modified gongfu style; that is, I rinse the leaves, steep up the first potful, and transfer it to a larger vessel (in this case a two-cup Chatsford teapot). After each steeping, before I blend them together (two infusions at a time), I pour enough into my glass cup to better appreciate the evolving colour, aroma, and taste. To my mind there is tasting tea and drinking tea, and having a teapotful makes it easier to drink after tasting. Two things I like about Taiwan Tea Crafts are that freshness of their teas and the details they provide about each one. You can buy oolongs from many vendors, but they don’t all identify the garden, the plucking date, how it was plucked (by hand or machine), garden elevation, even the cultivars that produced the particular lot (or invoice) of tea. A lot of vendors do not provide this kind of information, and it’s greatly appreciated by true tea-o-philes (otherwise known as tea nerds). Taiwan Tea Crafts has recently revised their shipping policy, making their teas and tea ware much more affordable and accessible to those of us who live outside of Taiwan. And they now offer sample sizes of each of their teas. Definitely worth checking out.